Production: 139 sets from 1941-10 to 1944. Standard on cruisers by 1943-6. The U.S. FC or Mark 3 fire control radar was known in British service as the Type 284. It gave no height information, but used lobe switching to achieve high directional accuracy. It was first tested in May 1941 and began to appear on Allied ships during the Guadalcanal campaign. It was FC radar that allowed Washington to straddle Hiei with its first salvo and rapidly render the Japanese battleship hors de combat. The sets were equipped with range gates, which, when activated, blocked returns except from a narrow window in range. The window could be set to be 500 or 1000 yards (460 or 910m) wide and was manually centered on the estimted range to target. 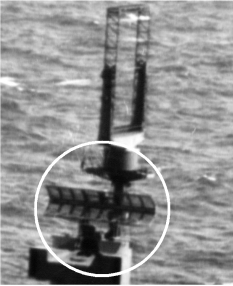 This allowed very accurate determination of range, but could lead inexperienced operators to chase their own ship's fall of shot rather than the target, as may have occurred at the Battle of Tassafaronga. By late 1944, FC was already obsolescent, having superceded by the Mark 8. This became painfully clear at Surigao Strait, where the battleships still equipped with FC got off very few salvoes.